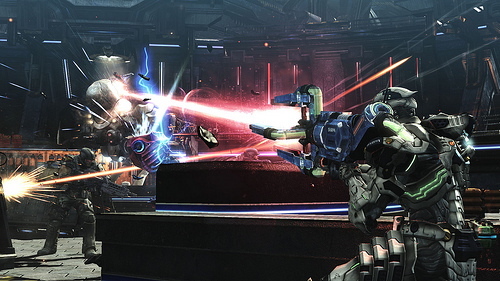 Hey, remember that thing about Sega having something for us soon on the western release for Vanquish? Well, apparently they weren’t kidding. Sega announced today that game will be released in the US on October 19 and in Europe on October 22nd. Yes! It has also been confirmed that a special weapons pack will be available for those who preorder the game at Gamestop. These killer-looking weapons include a Laser Cannon (pictured above), a Boost Machine Gun, and an Anti Armor Pistol. Luckily, they will be also available as DLC for both systems, so nobody has to miss out on the fun. Check out SegaBlogs for detailed descriptions of these bonus blasters. Now that the release dates have been finalized, this has shot up in line as one of my most anticipated games in a long time. Now these new guns are just pushing it further. Time to jump on that hype train, people. The conductor’s calling it. Wow, this pretty much has been the greatest nerd week ever. I have FFXII Zodiac etc etc translated, Persona 3 Portable on the way and Vanquish will be out the same week in Europe as everywhere else.